Have you seen that part on Portlandia that takes place at a feminist book store? When we tracked down the Hungry Hearts Cupcakes truck (@HHcupcakes on twitter) it happened to be smack dab in front of In Other Words bookstore, or better known on the show as Women & Women First bookstore. If you haven't seen Portlandia yet... I insist. It is a comedy masterpiece. 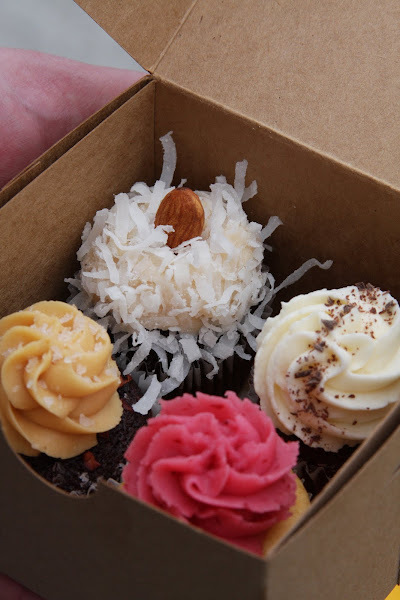 We ended up choosing the Red Velvet, the Dark Chocolate with dolce de leche frosting and Maldon sea salt, the Almond Joy chocolate cupcake with almond frosting and coconut flakes and the Lemon Drop with fresh lemon curd and wilberry frosting. Later on in the trip I was so excited when I noticed Black and White cookies through the window at Lovejoy Bakers in the Pearl District. I B lined it straight for the counter and ordered one. I eat mass quantities of these when we are in NY but I've never seen them out here. My family back east all think I am crazy for loving these cookies as much as I do. I like them so much that they were served at our wedding in NY. Lovejoy did a delicious take on the classic cookie but it just wasn't the same as the ones that I've been eating since I was little.